Birthday of the Gasparilla Inn on the Isle of Boca Grande. What a way to usher in the New Year. Yes, I’ll be working. But for many reasons I couldn’t be happier. The Inn encourages co-operation and group spirit among the employees. Management is polite and diplomatic. The list goes on and on. Great dinners, great desserts…I also love the totally wonderful Steinway concert grand dated back to 1924. It is vintage. Even better: It has just been totally rebuilt by master piano technician, Larry Keckler. After installing the strings and hammers from direct from Steinway in Germany, he said : “This piano has the sweetest sound.” It does. Diners at the Gasparilla Inn love my selections in it. Many make it a point to stay at the Inn regularly. This is even more so on its 100th Birthday. The Gasparilla Guest Book in the past has included: Tom Edison, George H.W, Bush, Jimmy Buffet, Harvey Firestone, Harrison Ford, Henry Ford and Katharine Hepburn (see feature picture). David is scheduled 6 nights weekly in season on this island resort. On a typical night you can hear music by Cole Porter, George Gershwin. You’ll authentic ragtime by Scott Joplin. The Inn was actually built at the height of the ragtime era. He also loves the great classics. His regular list this time of the year is a 30 minute rendition of principle dances from the Nutcracker Suite by Tchaikovsky. He plays Jupiter from the Planets by Gustav Holst. He loves to play the theme from the King’s Speech. It is the slow movement of Beethoven’s 7th Symphony. Excerpts from principle operas are often included. His favorite popular song to play is “Killing Me Softly.” The arrangement he plays by George Shearing is so beautiful that many diners have tears in their eyes. 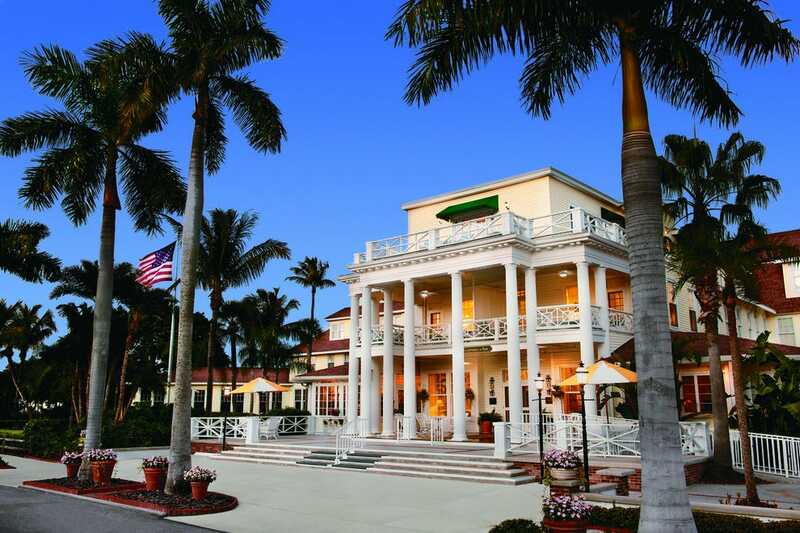 Beautiful and elegant Gasparilla Inn where David plays nightly. Our best for the happiest New Year ever – David and Sharon.